The Orchard is found on Park Road, Radyr on the outskirts of Cardiff. A friend and I meet up for a spot of lunch and a coffee on a blustery Saturday afternoon.The Orchard is a teahouse that serves lunch, cakes and afternoon teas. The first thing I noticed was that the small teahouse had a homely feel to it as if you were in someone’s front room. It was very busy when we arrived so we had to wait a few minutes while a waitress got us some chairs to sit around a small table. It was full of large groups having afternoon tea, which is £15 a person and looked pleasant with mighty portions of sandwiches and cakes. Looking at the chalkboard menus we were both drawn to the special, which was pan-seared halloumi in a ciabatta bun with salad, chilli and tomato chutney served with potato wedges and Orchard slaw (£7.50). Although there were some interesting teas on offer we needed a boost so ordered a soy latte (£2.60) and an Americano (£2.30). Our food arrived swiftly considering it was busy. 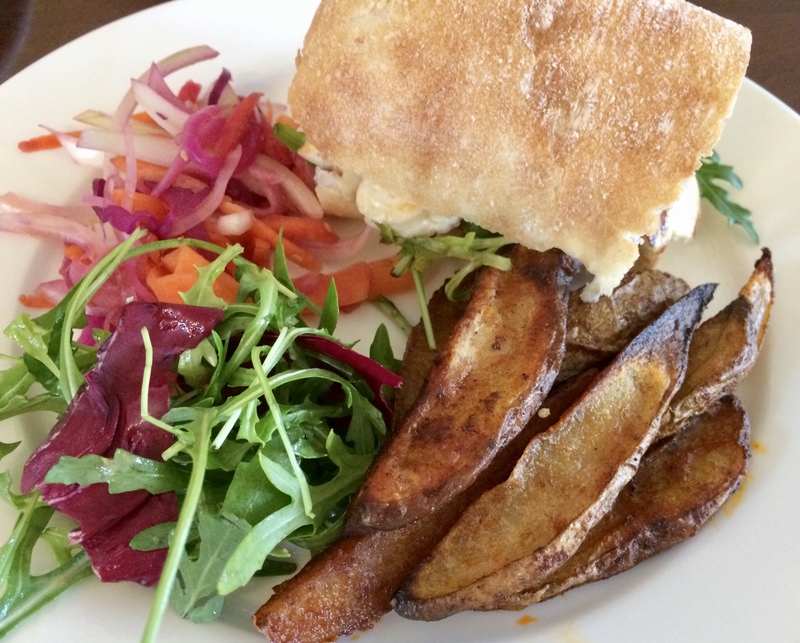 The meal looked a high standard for what in affect was a cheese ciabatta. The warm and crunchy bread was full of meaty halloumi. The chilli and tomato chutney was very sweet but did leave some heat in your cheeks. My friend wimped out and substituted her chutney for onion marmalade. She said it was really delicious.The wedges were gorgeous! They were thinly sliced, crispy and had a smoky texture. We both enjoyed them and wanted more!The slaw was pickled vegetable slivers that were colourful and vinegary. Unlike normal slaw there wasn’t any cream or mayonnaise, which was in my opinion not missed. Altogether this was a light and tasty dish, which satisfied the taste buds and the tummies. A great lunch option! Our plates were bare but unfortunately our coffees were missing in action. It seemed that in the busy rush of lunchtime we had been forgotten. The waitress seemed very friendly and bubbly so when we mentioned it to her she apologised and made them quickly. While she made the coffees our eyes wandered over to the cake cabinet. The lemon meringue cake got my attention and my friend felt the same about the Victoria sponge. There were however plenty of other fantastic options. With a slice each we were in cake heaven. The lemon meringue was everything it should be. Light, fluffy and angelic. The sponge was soft and fresh while the cream was thick. The lemon was refreshing. My friend enjoyed every mouthful of her slice of Victoria sponge. Overall the Orchard served food to a high standard while maintaining a teahouse charm. With its homely atmosphere and friendly staff I can understand why it is so popular. Its great to find a teahouse like the Orchard outside of the busy city centre. I will be back for more cake soon! Previous Spicy and Fragrant; The Thai House. great review. These cakes look delicious!